There are some offers you can't refuse. As a wannabe-mountaineer, when Vibeke and Hilde, two much stronger climbing friends, call and ask you if you want to climb the northwest ridge of Innerdalstårnet, you say yes. Even if they want to go midweek so you work all weekend and then spend seven hours each way driving to get to the mountain. Even though you literally have to dust off your climbing helmet as you pack your gear. 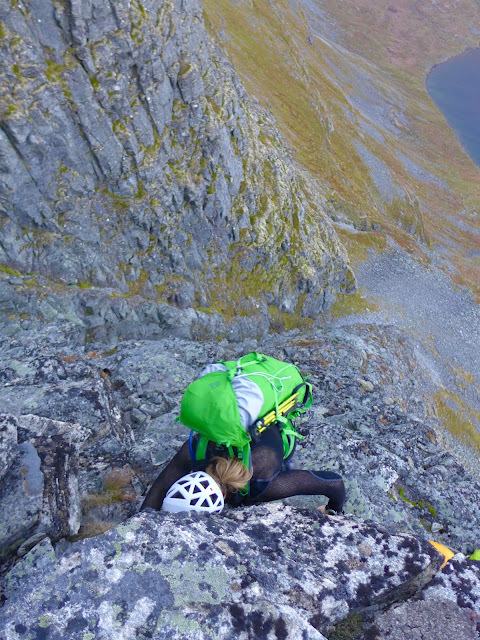 Even after you Google the route they want to climb and find the phrase 'most exposed route in Innerdalen'. The weather forecast is beautiful, they say, it will be great. Bring your thickest down jacket, in trad climbing we stand around a lot. I regretted my spontaneously descision the night before the climb as I tossed and turned in my creaky hut bed. Visions of tumbling to my death from a steep rock wall danced through my head. The alarm finally put me out of my misery, and we tumbled out of the hut in darkness for a good old alpine start. Before we could do any rock climbing, we had a three hour hike to the wall. The trail carried us through an enchanted forest of birches resplendent with bright yellow leaves, almost golden in the headlamp beam. And slowly, magically, the sun rose, illuminating the landscape with a rosy glow, and I began to remember why I do these things. 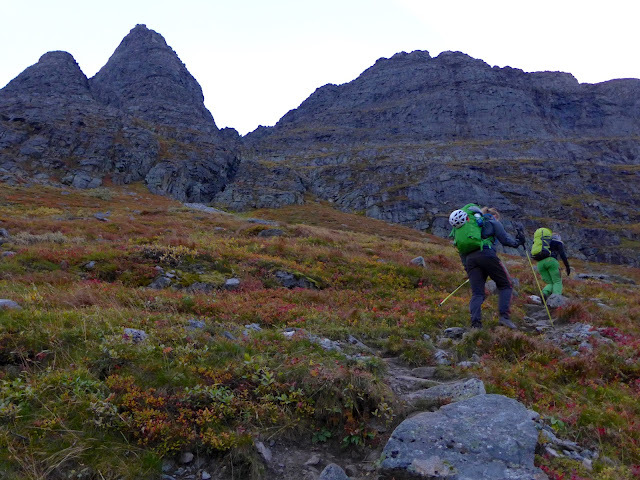 We followed the well-worn path that veered off from the Giklingdalen valley towards the main route up Innerdaltsårnet. 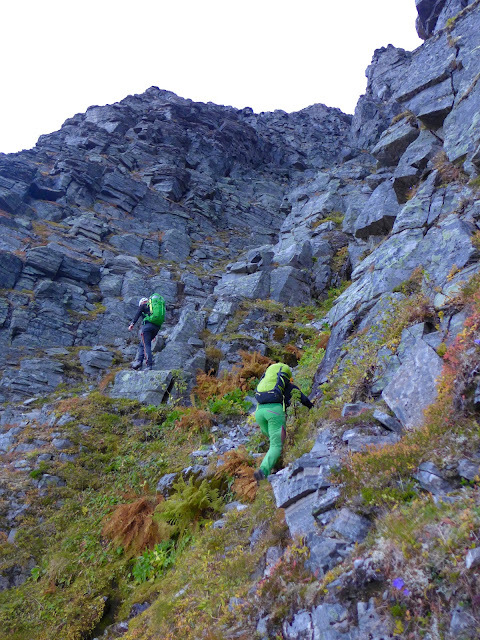 The main route up Innerdalstårnet is a steep scramble, passable for anyone without serious fear of heights. We planned to climb a route on the exact opposite side of the tower, and eventually followed a fainter trace towards the little tower below the looming cone of Innerdalstårnet. Hilde and Vibeke hiking to the base of the climb. The main route goes to the large notch to their left, while we were headed for the smaller notch between the two cones in the far left of the picture. Although I broke a sweat as we ascended the steep slope, the air temperature remained cold. We were and would remain on the shadow side of the mountain, but at least that meant we could watch a beautiful sunrise on the other side of the valley. The terrain grew steeper and steeper until we were full-on scrambling. Hilde said that she thought that moving through steep terrain like this, unroped, was worse than the actual climbing. I was in my element though, looking for the best path up through the ledges that lead to Litletårnet (the little tower). At the based of the scramble to Litletårnet. Yeah, I guess it was kind of exposed! I got nervous again when we finally got to the notch at the base of the wall we were going to climb. To make matters worse, so did my partners. "It's so steep!" exclaimed Hilde, craning her neck to look at the endless expansing of rock above us. Despite obvious misgivings, we were here to climb up and up we would go. Vibeke racked up to climb the first pitch, and I took the opportunity to snack and put on warming clothes. Hilde and Vibeke rack up at the base of the climb. As Hilde belayed Vibeke on the first pitch, I grew colder and colder. The wind was whistling through the notch we were standing and seemed to penetrate even my thick down jacket. As far as I could see the first pitch looked doable and I was excited when Vibeke finally shouted down that we could head up. Vibeke leads the first pitch. You can see the whole route above her. Halfway through the pitch I started to fumble around, and was unable to figure out how to proceed. Luckily Hilde was behind me, climbing at the same time on the second of the two ropes Vibeke had put up. With a few encouraging words on where to place my feet, I made it up the first pitch. 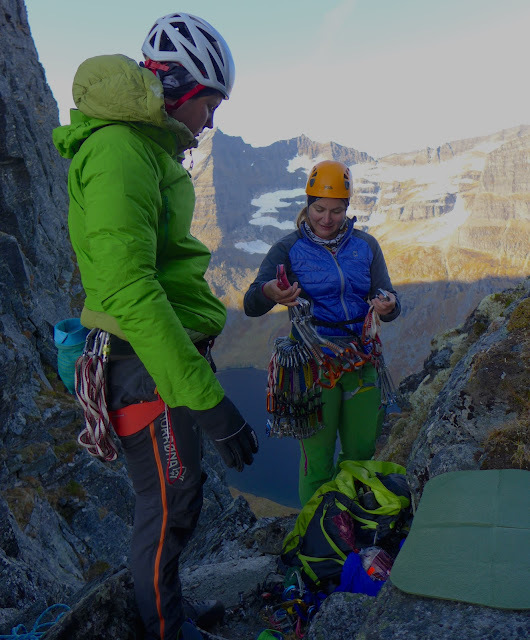 It was less windy on the wall, and Vibeke and I sat on a wide ledge with a beautiful view as Hilde lead the next, more difficult pitch. Hilde seemed to have trouble getting around an overhanging block, cursing and muttering to herself as she climbed. I was a little worried, but reasoned that with the rope above me I would make it up somehow. I made it around the overhanging block, and followed what look like the easiest route up the pitch, a little ways away from Hilde's line. All of the sudden, the climbing wasn't so easy, and I looked up to see my rope snagged on a rock far away. If I fell now, I would pendulum away from where I wanted to go and it would be difficult to proceed. I communicated this to Vibeke, and we decided she would climb up and unsnag my rope before I proceeded. So I stood there, on a ledge barely large enough to hang my toes on. Although I tried to remain calm, I felt helpless and the long drop to the valley floor below seemed to be growing. I began to shake involuntarily. I turn my head towards the rock wall and placed my hands on it, feeling its solidness, reminding myself that everything would be OK. Then I began to plan my next sequence of moves, rehearsing them in my mind. Finally Vibeke unsnagged my rope and I could move again. "1-2-3!" I shouted at the tower, and pulled myself up on the rock. Forward progress was so much better than standing still. I climbed the last part of the pitch with a vengeance. Two down, three to go. How we I be able to make it? Hilde sets out on the steep third pitch. The next anchor only had a tiny ledge, and I stood so that Vibeke could sit as she belayed. I shifted from one foot to the other constantly, trying to alleviate the pain in my toes from the time spent in my tight climbing shoes. I was still shivering, and I could only stop if I actively relaxed. The next pitch was as difficult as the previous, but I felt like I was able to approach it like a puzzle, and solving the sequence of moves. I was starting to get tired though, and had to take a short rest. Luckily the final two pitches would be easier. Near the top of the third pitch. "Can you hang on there while I take your picture?" said Hilde. "No!" I said. But I did. The belay area for the fourth pitch was so tiny neither I or Vibeke could take off our backpacks. This pitch was easier though, and Hilde completed it more quickly than the previous two. As the wall grew less steep, my shivering finally started to subside and I began to believe that we would reach the top. 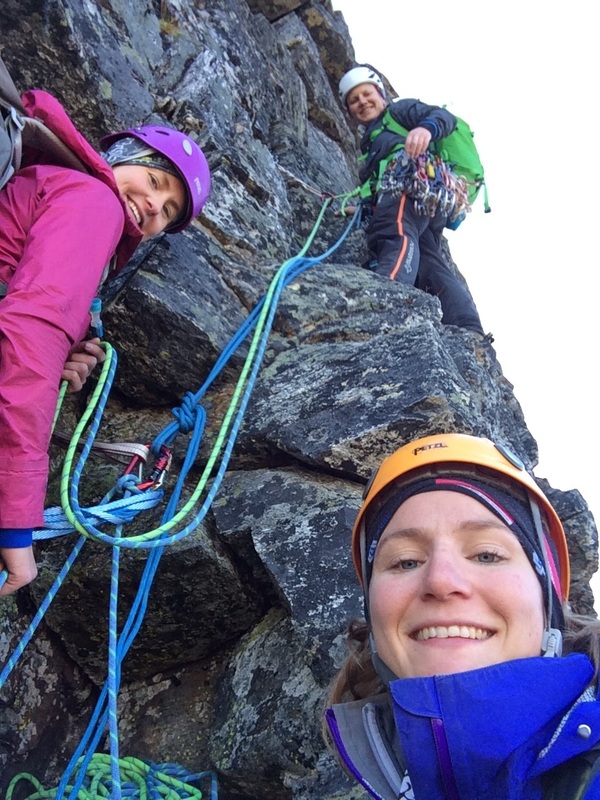 Vibeke takes a selfie of me belaying Hilde on the fourth pitch. 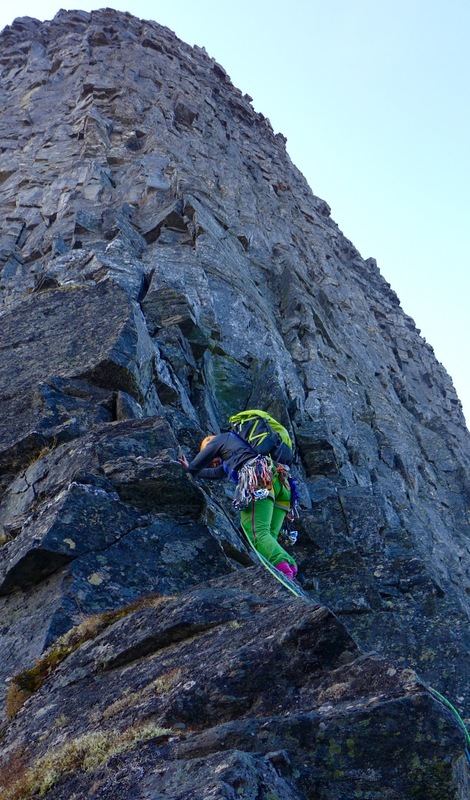 Vibeke lead the final pitch up a series of mossy ledges. Hilde and I followed to find her belaying us in the sun on a anchor attached to the enormous summit cairn. Group photo on the top! We descended the main route, which was spicy enough for a non-climbing route - I wouldn't want to do this if it was wet! On the hike down we finally got to spend some time in the sun, although the day was drawing to a close and the sun eventually disappeared behind the mountains. Vibeke soaking in the last rays of sun. I didn't realized how tired I was until I literally stepped off the trail and fell on my face. I was fine, but ate a Snickers and very carefully placed my feet for the rest of the hike out. 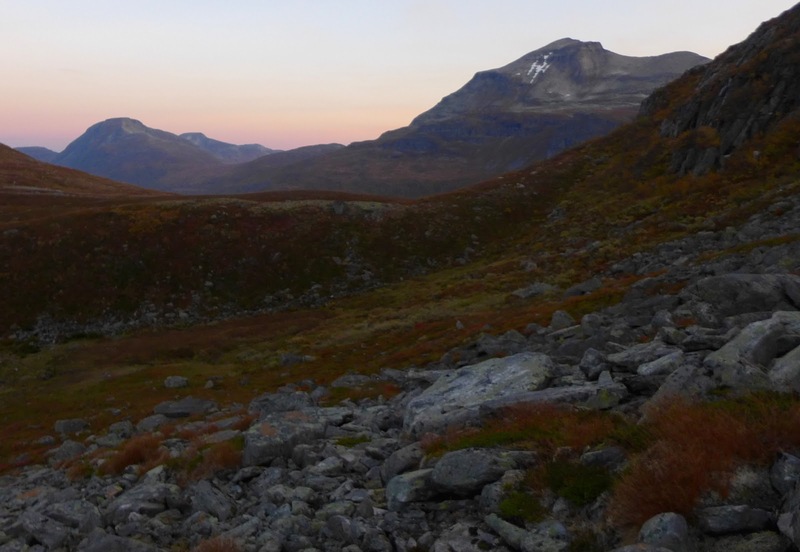 The next day was just as beautiful as the first, and we got in a short hike up to Bjøråskardet pass before heading out for the long drive home. Vibeke on the climb to Bjøråskardet, with Skarsfjellet in the background. Thanks for a tale well told. I was shaking there right on the tiny ledge with you! !